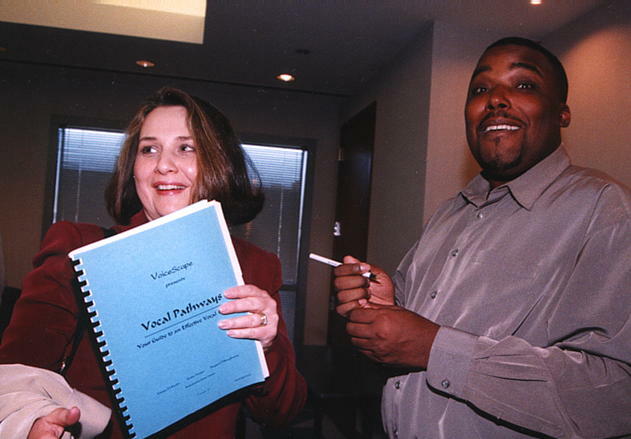 What is Vocal Image Training? Voice-to-voice contact, from basic phone conversations to voicemail to teleconferencing, is a primary mode of business communication in today's business climate. Our vocal images create an immediate impression on a future client, employer or important business contact. ...that within the first 10 seconds of hearing your voice, your listener has already made at least 5 judgments about you? Research shows that we all have a tendency to make snap judgments about people and their ability to do their jobs just based on the way their voices sound to us. natural sound, and then guides them to make simple adjustments for maximum impact on listeners. Our skillbuilding sessions are highly participatory, and the results are longlasting. call centers, workgroups, frontline personnel, and customer service representatives. individuals too---click our link above for One-on-One coaching! "Live contact will never be replaced by a machine...Customers want answers now, if not sooner, and from a human being."